A Glossy Life: "The Servantless American Cook"
Hi All, wow Monday came fast. A little weekend recap for you: Testing cocktail recipes for not your average kids birthday party next weekend, a little home project that involved entirely too many cans of spray paint (more on that later in the week...oh, I feel your anticipation), a little down time at the neighborhood pub, and finally getting to see the movie I've been waiting for all summer. I read Julie & Julie last summer and have been on pins and needles to see Meryl Streep play Julia Child. Remember my quest for a vintage copy of Mastering the Art of French Cooking? Well, it's still ongoing, but I did get to see the movie last night. I know everyone else saw it last weekend and has already passed their 2 cents around the blogs, but I'm a busy girl and was a little behind. So, better late than never: I love, love, loved it! There will probably be a run on copper pots all over the country this summer, because I know that's what I was thinking during the movie--how badly I wanted some beautiful copper pots to line along my kitchen wall. Which, consequently made me think of the other piece being passed around the blogs this week: That kitchen shot from the Badgley-Mischka kitchen featured in the latest Elle Decor. 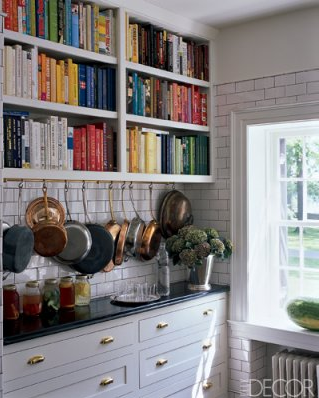 I know I say this on a bi-weekly basis, but this may be the kitchen of my dreams. A modern version of Julia's little french cuisine. 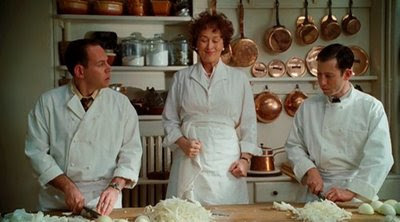 The other piece I loved from the movie was the Le Cruset Dutch Oven that Julie and Julia both used. About a year ago, after visiting my grandmother and spending a weekend cooking family reciepies, a box arrived at my door. I opened it to find my very own Le Cruset with a little note that read something akin to 'real cooks need real cookware'. And it's true, I do feel like a real cook when I use it. Maybe beef bourgogne will be next on the menu. I loved this movie SOO much when I saw it last week on vacation! I'm on the quest for a dutch oven myself - i'm determined to make beef bourgogne the first chilly day we have! Didn't you leave that movie FAMISHED? I loved this movie too! Your blog is charming, I am so glad to stumble across it...keep looking for the cookbook -it's a must have. Great post! This movie is on my list, and I like what you have to say about it. Kudos on your cookware! Update: With some out of town visitors here in DC, a re-visit to the Smithsonian kitchen exhibit was in order. It was great! I love the little pink pot. Super cute.